"There's a wide range of folks we haven't seen in a while. In a lot of ways, it's a great hiring environment for us," said Harris Liu, owner of the K Street eatery and five other area McDonald's locations in Sacramento, Woodland and Vacaville. "People who hadn't considered us are now considering us." Michael Smith and Julius Giles couldn't be less alike. Smith is 63 with three children in college and a veteran of 25 years in the local television business; Giles is a 23-year-old Sacramento City College student and a single father of a 2-year-old daughter. But on Tuesday afternoon, the two shared a table at a Sacramento McDonald's: unemployed, applications in hand, waiting for their names to be called. "Forty years between us, and we're at the same table," Smith of Sacramento said. A lot of people might as well have been at the same table. Smith and Giles were among thousands who showed up at McDonald's outlets throughout Northern California and western Nevada – trying to land one of 1,000 jobs the company was filling during a hiring day event. More than 100 applicants came to the K Street site alone. It was a graphic example of the economic pain that has been visited upon the region the last two years. 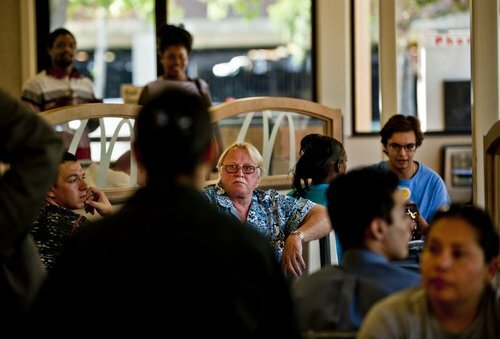 Unemployment continues to hover well above 12 percent in the Sacramento area, and furloughs have cut hours and pay for thousands of state workers. Now, older, experienced workers compete head to head with teens and young adults for part-time positions at fast-food restaurants. For all their differences, Smith and Giles were drawn to the McDonald's event for the same reason – the possibility of a job with health benefits. "Medical benefits – that's the big draw right now," Smith said. "I had an allergic reaction to medication. Now I'm in debt for that." Giles' 2-year-old weighed heavily on his mind. "I'm trying to provide for her right now," he said. "All you've got to do is try. That's why I came here. I didn't want to give up." Others applying at the K Street store included first-time job seekers; students hoping for a job to help pay for school; older professionals looking for management positions; long-term unemployed hoping to break out of their rut; and state workers trying to ease the impact of furloughs with a second job. McDonald's has used the hiring day strategy before, but Tuesday's event was the largest it has held. The company is one of the rare employers in a position to open its doors to thousands of applicants. For one thing, there are a lot of current openings, as high school- and college-age workers head back to campus. And McDonald's can afford to fill those openings because it and other fast-food restaurants have been relatively unscathed by the recession. "When the economy takes a turn, consumers tend to focus on value in all aspects of their lives," said Daniel Conway of the California Restaurant Association. "They want to combine convenience and value and still have the fun of going out to eat." Throughout the day at participating McDonald's restaurants, job seekers could apply for part-time positions and interview with managers on duty. About 300 applied at Courtney Ristuben's five McDonald's locations in Citrus Heights, Fair Oaks and Folsom. There, she saw "people from (age) 16 to folks with families; people with four-year degrees to others with résumés two pages long." The scene was repeated at McDonald's restaurants from Sacramento to Visalia, Reno to the San Francisco Bay Area, with managers describing lines that formed around restaurants and spilled into parking lots, said Julie Wenger, a McDonald's regional marketing manager. "It's hard to be choosy right now," said Serena DiPiero, 48, of Sacramento, waiting to be called for an interview at the K Street store. DiPiero worked her way off welfare 10 years ago, but in May she lost her job at an assisted-living facility. She still remembers one of her first jobs at a McDonald's in 1979. "I have the experience," she said wryly. "Basically, I'm trying to get back into the work force."